When I was in graduate school my roommate tried to teach me chess. He had this chessboard that he could play against but I think that got old eventually. I never became very good and frankly, I've forgotten most of it. I never beat him but once or twice I put him in a bind that it took him a few moves to work his way out of. If chess were more like the 1979 Kung Fu classic The Mystery of Chess Boxing I probably would have demonstrated a much keener interest. In the film, the Ghost Face Killer returns to seek his revenge on the locals who had plotted to have him killed. Among his victims is the father of a young boy who's a bit hapless. He is determined to learn kung fu and have his revenge. Eventually he falls in with an old Chinese chess master who teaches him the lethal yet beautiful combination of chess and kung fu. In the end it turns out to be barely enough to best his father's killer and his deadly Five Elements style of kung fu. In addition to being a classic of the genre the film was wildly inspiration for the Staten Island hip hop pioneers the Wu Tang Clan. Their track Da Mysteries of Chessboxin' from their first album Enter the 36 Chambers is an all time hip hop classic on an album full of them. Additionally Wu Tang member Ghost Face Killer took his stage name from the film. Today's Friday Find seeks not the combination of chess and lethal fighting acumen, but instead wine. The Bishop's Blend from William Church Winery. The Cabernet dominant blend is made in an approachable and easy drinking style. Lots of wood spice aromatics as the oak plays a substantial role in this wine. Round, velvety and goes down easy with black cherry and baking spices on the palate. For $19 this wine won't necessarily help you get revenge against the kung fu master who killed your father, but it will be a wine with lots of mainstream appeal the next time you're invited to a friend's house for dinner or a party. 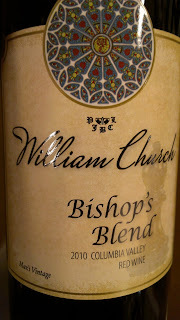 This wine as well as many of the William Church wines are widely available in Seattle.